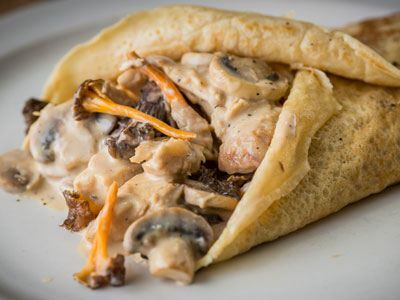 Delicious savoury pancakes which everyone will love. Heat the oil in a large non-stick frying pan and add the sliced mushrooms. Cook on a high heat until they begin to soften, then add the diced chicken breast. Crumble the stock cube over the pan and stir until the mushrooms are cooked and the chicken is hot throughout. Add the Carnation Evaporated Milk and bring to a gentle boil for 5 minutes. Make sure you keep stiring until the sauce becomes glossy and coats the back of a spoon. Spoon onto a warm savoury pancake and serve with a sprinkle of black pepper and a fresh green salad.